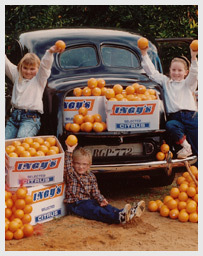 The Ingerson family began citrus production in the Riverland in 1930. Today the third and fourth generations of the family are managing the four Riverland properties, with the same commitment to the quality fruit production and service that was begun 75 years ago. The family properties are located at Bookpurnong, Berri, Loxton and Albemarle. This geographic spread allows Ingy’s to source fruit varieties as each reaches its peak maturity, flavour and quality. Ingy's plantings are now mostly young and yet to reach full production with significant changes during the last 10 years towards new citrus varieties.